HOT SPRINGS, Va. – I don’t think I’ve ever been to a place quite like The Homestead. 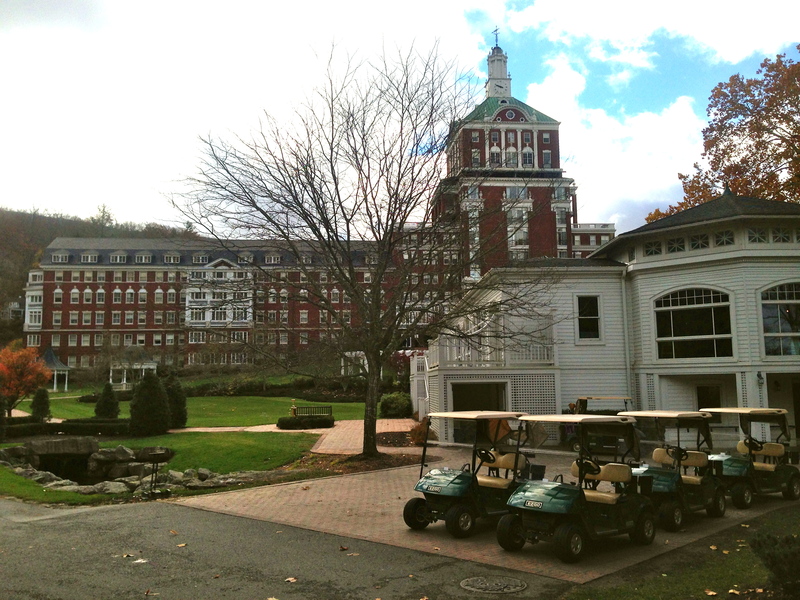 This resort – officially The Omni Homestead since July of 2013 — is about so much more than golf. Located just 39 miles over windy two-lane roads from the West Virginia state line, The Homestead also offers such things as falconry, state-of-the-art snowmaking for skiers and snowmobilers, and a new Shooting Club House and Pavilion. There’s also a two-acre water park, a new spa, an equestrian center, clay courts for tennis buffs, a miniature golf course and elaborate trails for hikers, cross country skiers and mountain bikers. The Homestead’s traditions include movies every night, afternoon tea in the hotel’s Great Hall and ornamental gazebos around the naturally-heated springs, all chemically unique. 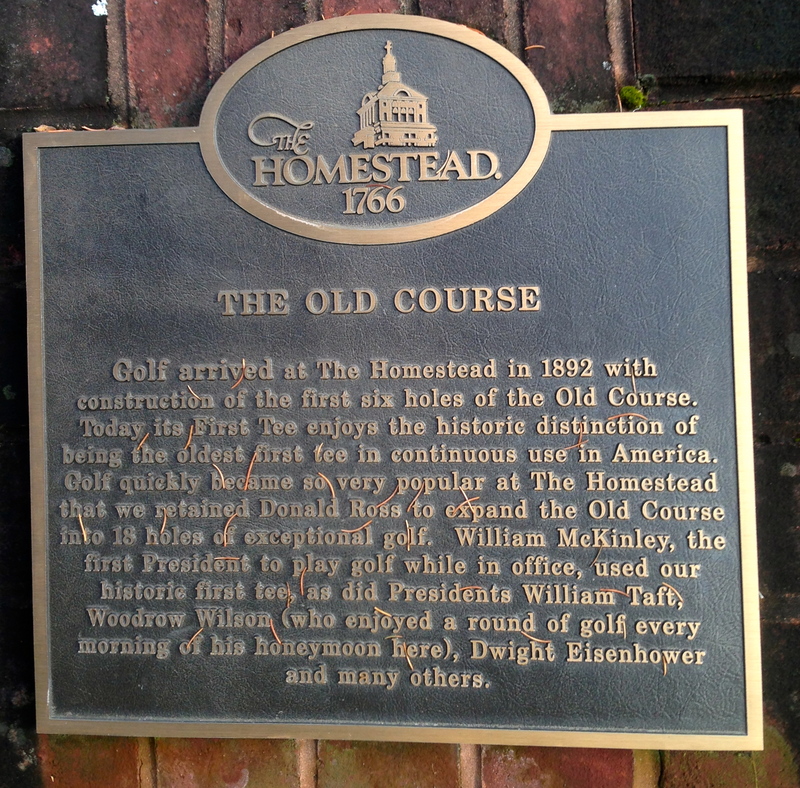 In fact, you might suspect that golf is being downsized, given that one of Homestead’s three 18-holers – Lower Cascades – was closed two years ago. 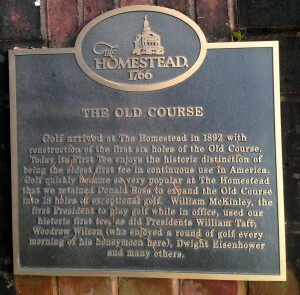 The nation’s oldest first tee in continuous operation gives Homestead’s Old Course something special. More than anything, though, The Homestead is all about history. Twenty-two U.S. presidents have visited the charmingly elegant hotel since the resort opened in 1766 – that’s 10 years before the United States declared its independence — and the golf played there is a prominent part of that history. Golf was why we were there, and our two-day early November visit fell in less-than-ideal weather. Half of our round on the well-decorated Cascades Course was played in rainy weather and our tour of the Old Course was played in 37-degree temperatures and 50 mile per hour winds that knocked many of the pins out of the cups. Still, all was good. 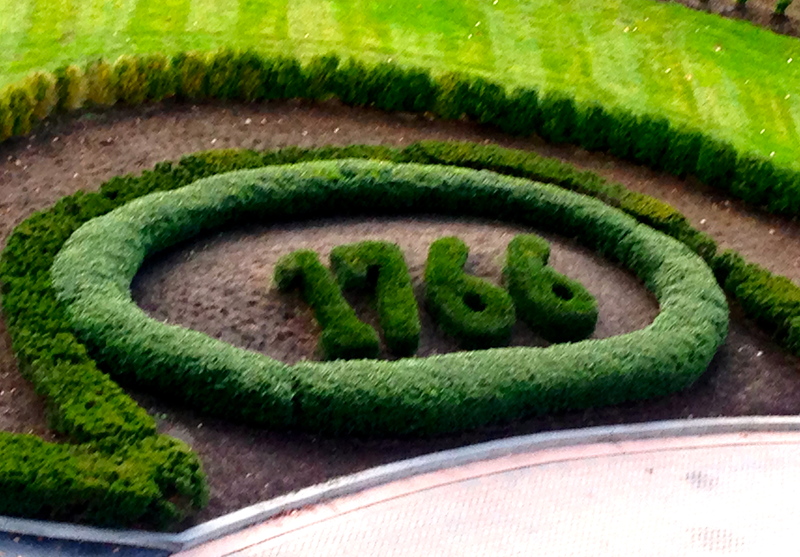 Being a golf history buff, we were particularly intrigued by the Old Course. No course has quite the history this one does. You’re informed before the round that the No. 1 tee is the nation’s oldest first tee in continuous use. The first tee shot was struck there in 1892 and head professional Mark Fry said 18-hole rounds were played almost from the outset. That suggested an historical controversy could be in the works, since Chicago Golf Club has long claimed to be the nation’s first 18-hole course. It also opened in 1892. Homestead’s majestic hotel looms above the Old Course pro shop. Fry, though, informed me that only six holes were available when the Old Course opened and that players covered 18 holes by playing it in three loops. So, Chicago Golf Club’s claim remained intact. The Old Course didn’t have 18 different holes until 1901. (By then Chicago Golf Club was six years into playing its second 18-holer. The original, in Belmont (now Downers Grove), is now down to a sporty, heavily-played nine-holer run by the Downers Grove Park District). Donald Ross designed the Old Course and well-respected later architects William S. Flynn and Rees Jones eventually updated it, but the Old Course is still only 6,099 yards from the tips with well-contoured fairways that leave you side hill, uphill and downhill lies to relatively small greens. The course is a bit quirky, too. I’ve never heard of a first hole being declared No. 1 handicap hole (but I don’t quibble with that choice here). The Old Course also is unusual in that it has back-to-back par-5s on both nines and a par-3 finishing hole. All that is noteworthy, but – again – history is what really sets the Old Course apart. Not only does No. 1 have the nation’s oldest first tee in continuous use, it also is the place where the first sitting President of the United States played golf. William McKinley smacked his first tee shot there in 1901. He didn’t really take to the game, but William Howard Taft was an avid golfer and the Old Course may have been the course he played the most during his Presidency. Cascades, once known as Upper Cascades, opened in 1923 and has a modern-day feature with a waterfall (above) beside the 17th green. Cascades has its history, too. The first head professional there was the legendary Sam Snead, who was born in Hot Springs and began his working life as a caddie at The Homestead when he was 17. Snead eventually made hickory-shaft clubs in the Casino, the name given to the Old Course pro shop and tennis center, and worked on the construction crew that built Cascades. In 1934 Snead and was named the Cascades’ head pro. Among his duties was giving lessons there, at a cost of $3. Naturally, he also played there frequently and had a best score of 61 that included nine consecutive threes on the back nine. Snead passed on three days before his 90th birthday but his name, and family, remain prominent in the area. The road leading through Hot Springs is Sam Snead Highway and his son, Sam Snead Jr. (called Jackie) owns Sam Snead’s Tavern – a local hotspot. It’s the first of 19 restaurants nationwide that bear Snead’s name, but the only one that is still owned by Sam Snead Jr. He has leased it to The Homestead but is a frequent visitor and was there the night we visited. Sam Snead’s Tavern is a most friendly dinner place with lots of great Snead memorabilia and good food. Jackie Snead – in an unsolicited but very nice gesture – sent us an autographed copy of the menu that includes some helpful historical data. 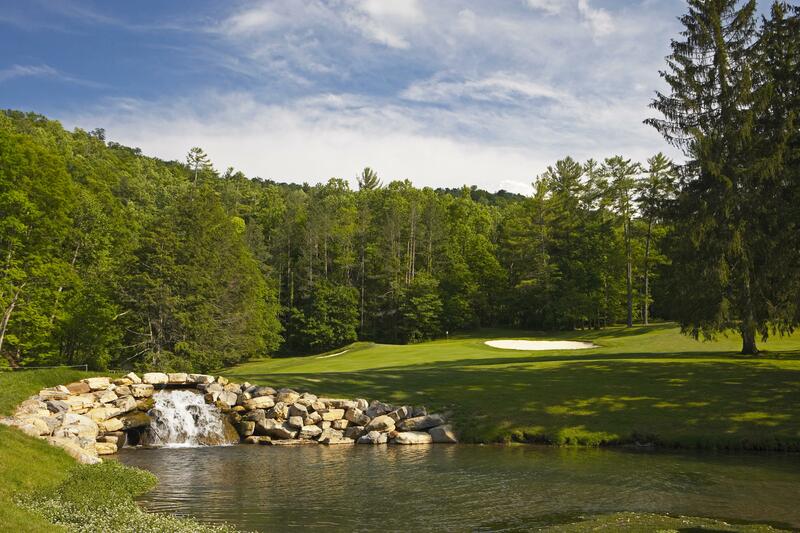 Cascades is considered one of the nation’s best mountain courses. It was designed by Flynn and has been ranked among America’s 100 Greatest Public Golf Courses by Golf Digest. The Allegheny Mountains provide a breathtaking backdrop for the golfers. It’s never been a PGA Tour site, but has hosted seven U.S. Golf Assn. national championship ranging from the 1928 U.S. Women’s Amateur to the U.S. Senior Women’s Amateur of 2009. Probably the biggest USGA event played at the Cascades was the 1967 U.S.Women’s Open, an event that resulted in Catherine Lacoste of France winning the title.